I am going to assume that you already know something about Soviet rock band Kino and his legendary frontman Viktor Tsoi (or Tsoy), since you are reading this article. That’s why I won’t bother with providing extra information about him or his work. The intention here is simply telling a couple of things about my self-invented pilgrimage to three places in Russia that are somewhat related to Tsoi, maybe providing a few clues, if you want to make a similar trip in the future. Actually you don’t need to visit those spots to understand how much he is still loved and his memory is cherished by Russian -and former Soviet- people. Walking on a random street in Moscow or St. Petersburg would be enough, since you can easily bump into street musicians who would be singing ‘Kukushka’ or ‘Zvezda po imeni solntse’ or some other Kino song. Even in former Soviet countries, where Soviet and Socialist heritage and even the Russian language are mostly renounced, you can hear Kino songs from an anonymous singer. But, those three specific locations in Moscow and St. Petersburg would give you a better feel about the legacy he left after he was tragically killed in a traffic accident in 1990, at the age of 28. He still ‘lives’, as his passionate fans call it, “Tsoy zhiv”. I would like to tell you a couple of things about those places, their significance and a little bit of help with directions that might help you find as well. Tsoi Wall in Moscow is mostly populated by those “stable” guys, but there are also lots of tourists around as well. Probably the most popular and easiest to reach memorial spot for Tsoi. 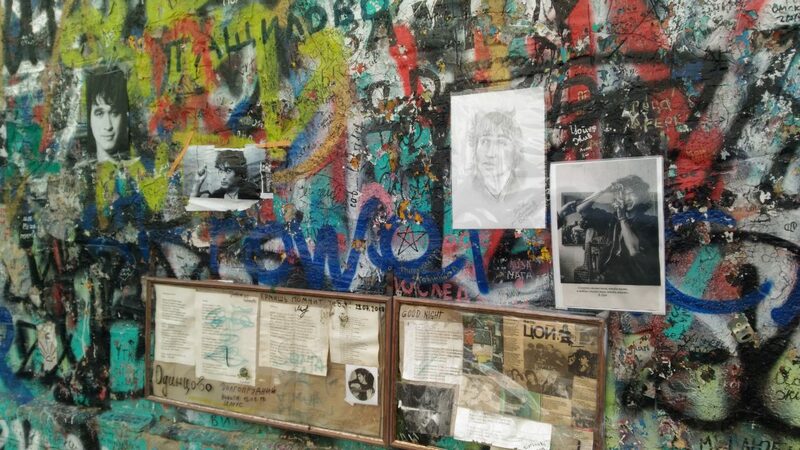 According to the story, on the day Tsoi died, 15th of August, 1990, one fan of him from Moscow wrote on a wall the following words: “Viktor Tsoi died today”. Another fan came by and replied: “Tsoi zhiv (Tsoi lives)”. 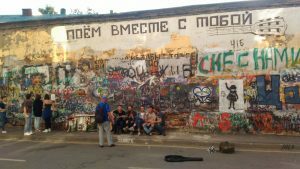 After that incident, the wall, which is at the intersection of extremely lively (Old) Arbat Street and Krivoarbatskaya Street became an instant and spontaneous memorial for Tsoi. The wall has been decorated with many graffittis and murals since that day. It is also customary to leave a cigarette there, in homage to his unforgettable song “Pachka Sigaret (Pack of Cigarettes). I seriously doubt though, that those cigarettes remain on the ground for a long time. There were several guys who seem to be stationed around the wall, I believe they collect them as soon as you leave. In fact, if you arrive there so early or late, they may approach you and ask for cigarette, if you don’t have one, they might switch their interest to your money. So, beware of that possibility and try to arrange your visit during the crowded hours of Arbat, which would not be too difficult to do, I think. In any case, never skip this lively corner of Moscow, where you can find many other Kino fans around the world. Since Tsoi had spent majority of his lifetime in Leningrad, which is today known as St. Petersburg, it makes quite a lot of sense that his resting place is located in Petersburg. The cemetery is called “Bogolosvkoe kladbische” (kladbische means cemetery in Russian) and at the nortern part of the city, at Kalininsky District. It’s a little tricky to get there though, you can either take a minibus, for example bus #30 from Finlandiysky Train Station (Lenin Square) would directly take you there. Or simply you can go to Lesnaya metro station of line 1, which is the closest station to the cemetery, and ask for directions and advices to reach Kondratyevsky Avenue. If you select to walk, the distance is about 3,5 kilometers, I did it but I don’t recommend. Once you get to the cemetery, you will see a map at the entrance. Tsoi’s name is among the ones which have been marked and it is really easy to locate his grave. The space right next to Tsoy’s grave has become kind of a square, as there are two benches with Kino logos. Don’t be surprised to see empty beer bottles in the trash bins. After looking at those remains, it’s easy to imagine a small memorial ceremony that took place last night. Tsoy’s gravestone is a black rectangular marble, with a half-circular shaped plaque attached on it, the sun, sunbeams and Tsoi’s silhouette are engraved on the plaque. Obviously many bunches of flowers, papers with his lyrics and some little religious objects were also present. You’ll surely get the vibe of his legacy over there, even if you are alone during your visit. Note that there are some other graves around that you should at least take a look. Tsoi’s wife Marianna’s grave is on the right hand side while you’re facing his husband’s grave. His mother Valentina’s grave is at the left, about 10 meters away. Also another Russian punk-rock legend who died unexpectedly early, Korol i Shut’s Mikhail Gorshenyov’s final resting place is very close to Tsoi’s. As I mentioned above, Tsoi was a man from Leningrad. That means that his career beginnings, his rise to underground fame and subsequent stardom all happened within the boundries of today’s Petersburg. In that beautiful city, one special spot especially worths noting and almost mandatory to visit if you’re determined to complete such a pilgrimage. Besides from being a musician, Tsoi had a ‘legitimate’ full-time job at a boiler of a building in northern Petersburg. He continued this profession well into his musical career. That boiler (kotelnaya in Russian) now houses a small museum and a bar. 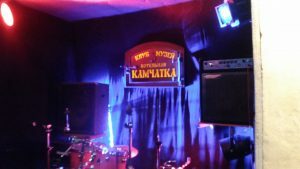 Located at the Blokhina Street 15 at Petrogradsky District, this is the spot where you will feel the atmosphere of an underground Soviet club from the late 80’s. At least that’s what I feel. 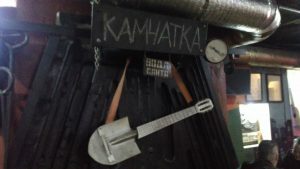 The story behind the name ‘Kamchatka” is supposedly boiler’s being overlooked and ignored by other people, just like Kamchatka, which is at the Eastern-most end of USSR land and practically impossible to reach. The location is -of course- not as far as Kamchatka itself, it can even be considered at the center of St. Petersburg, but I get the idea behind the naming here. 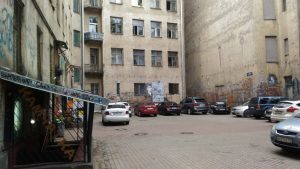 Entrance of the club is not on the street but at the rear, and when you find there, you will also observe a typical Soviet backyard. (I mean, I didn’t have the chance to live during Soviet era, but this is my guess from old movies and videos, at least from Igla, the movie Tsoi starred in 1988). Surrounded by old, damaged buildings with some shattered windows, this backyard almost feels like you have time-travelled, especially comparing with the rest of the modern, beautiful and continually developing St. Petersburg. Like Tsoi Wall, there are many murals on those walls. 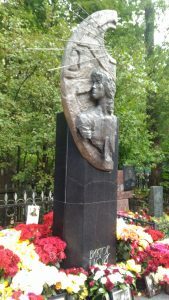 Right at the entry to the club, there is a small memorial plaque and with Tsoi’s silhoutte and the refrain from “Zvezda po imeni solntse”. Boiler Kamchatka is located at the left hand side of this small “square”, which is named after Tsoi. The club itself is not only a small one, but also has the atmosphere that it has not changed since the 80’s. On the walls, there are many photos of Tsoi along with some valuable objects connected to him. The most previous gem of that modest collection is definitely his original guitar. During my visit, I had heard nothing but Kino songs. The club organizes a concert for every day of the week but Monday. I was lucky to attend a concert of a Kino-tribute band called “Foye” (ФОЙЕ). The formation of the band and the frontman Gani Sauhanov’s undeniable physical similarity to Tsoi made me feel even more like I’m in a random club from 80’s Soviet underground rock music world. I am telling you this, although I was probably the only person who was not a citizen of a former-Soviet country on board -also the only person who didn’t speak Russian-. You can figure the rest. The attendance had a relatively higher average of age, although there were younger people who were probably born well after Tsoi’s era. But they were able to accompany to the songs really successfully. All in all, the atmosphere was awesome before the concert actually started, and it got only more electric as it progressed. By the way, you would have to pay 300 roubles (less than 5 $) to attend the concert. I won’t get too much into detail about the concert. I had spent absolutely great two hours. I kinda repeated the refrains of the songs that I knew well. For the rest, I shook my head with the rhythm and simply enjoyed the warm atmosphere created both by the band and the loyal fans. Maybe my record of Spokoynaya Noch would give you a better idea, although it is not a high quality video. Not: Yazının Türkçe versiyonu için Yazıhane‘ye yazdığım yazıyı okuyabilirsiniz.